I have always had great service from a Fenix Light. The service after the purchase was great. They sent replacement headbands for one of my headlights. Their lights does put out unsurpassed lighting for such a small headlight. Really great light. Comfortable, lightweight and very bright. Easy to use. Great headlamp for budget-minded hikers/backpackers. I prefer the style of the HM50R, but this is also a great headlamp and is rechargeable, all for a reasonable price. Love the brightness and functions of the Fenix HL26R rechareable Headlamp. Pleased with the lumen level and battery life between recharges. Great lightweight headlamp. Performs as advertised. If you’re looking for something that doesn’t require extra batteries, is lightweight, and can handle some trail dust, this is a good option. I was using it for work. Not labeled intrinsically safe, but I don’t need that. I ended up using the flood options more than anything. Those worked very well. Spot gets out there pretty good. Adjustments were adequate for me. Band is comfortable. Don’t really hike, but decided to be a dork and take it to the gym. Stayed on and pretty much in place while working out and about an hour walk on a treadmill. I try other brands , but Fenix just seems to get things (mostly) right. This light is no exception and near perfect for my needs which are either around the house or solo camping. Most any decent headlamp will work for around the house, but where selection really comes into play is for activities such as solo primitive camping. You want a light with variable outputs depending on what you’re doing. For example, when operating around your campsite, something around 50 lumens is enough. Walking at night, on the other hand, such as when having to relieve yourself in the middle of the night, is another story and you want something around 150 lumens. Reason is, you want to be able to see if you’re walking towards a bear or some such and the greater distance gives you better warning. Then there’s inside your tent/hammock where just around 1 lumen or so is enough especially if your eyes have gotten used to the dark. Ah, and then there’s if/when you hear something moving around outside. That’s when you want the most powerful burst possible to 1) see what it is and 2) hopefully send it running off. The closest headlamp to this one would be the Nitecore NU30, but the Fenix HL26R is still superior for the simple reason that it provides a constant current. The NU30 current isn’t regulated and starts to dim immediately and while it states it has a higher lumen and greater runtime per lumen, the output/brightness starts to drop immediately. Around the house with easy access to a charger it’s no big deal, but having to worry about that out in the field is a different story. Having a constant light output is very important in the woods and you want a light with a reliable output. Where the NU30 beats the HL26R is with the red light (kinda). Having a red light is very nice when having to move around inside the tent/hammock to re-position things. Having a white light can actually be a little painful when everything else is super dark. Where the NU30 got it wrong was that they made the red light too bright. All this being said, the only improvement I would make the HL26R would be to add a low lumen red light or one that had two light outputs such as something around 1-4 lumens and then maybe around 30. Oh, and of course, longer runtimes are always nice. A replaceable battery would be great too. This is my 4th light from Fenix. Love these products. I got this headlamp to provide extra light for looking down my gun barrels when cleaning. Storm season rolls around and it was the perfect tool for illuminating the storm shelter. Great for use in the attic as well. While I really like the features and functionality of this light, I wish there were some changes. On the black model, why is the band blue? Should be black. Burst spotlight only stays on for 1 minute then steps down to high spotlight. David, thank you for your comment on the HL26R. You can activate the burst mode repeatedly to get the 450 lumen light for a longer period of time. If you are looking for a headlamp with a higher lumen output, similar to the burst mode on the HL26R, we are launching a headlamp very soon that will be more to your liking. Stay tuned! I used my HL26R on a night time 10 mile trail race last weekend, it performed awesomely! At the start of the race, it was snowing and sleeting, eventually turning into a downpour of rain. The headlamp worked flawlessly as the weather pummeled it. I am a huge fan of the Fenix HL55 headlamp, but wanted something lighter for shorter night runs. The HL26 proved to be bright enough to allow me to traverse the roots, rocks and obstacles on the trail. For technical night time trail running, where weather can get messy, this headlamp is an amazing deal and proved to be a great piece of gear in my ultra-running bag of tech. 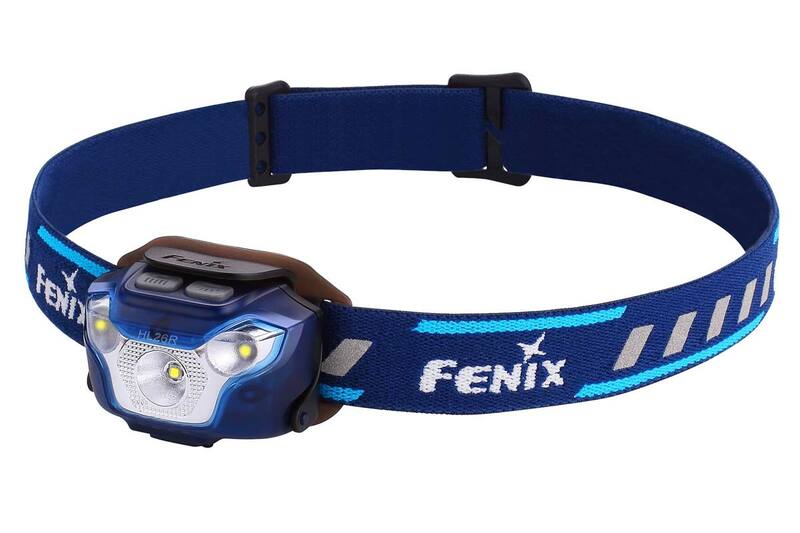 Another great Fenix headlamp. Fenix is the type of equipment that if your life depends on it to work you will not fail. This equipment is engineered durable, is built reliable, and contains design features that other vendors are still trying to see. The fit and finish is excellent, run time durability is not over stated so you know what the device will, do how it will do it, and when it will deliver.